Should admissions offices rely more on faculty, less on current students to win prospective students over? Since I started to write on this blog (almost 6 years ago – in February 2005), online efforts for admissions have focused on relying on current students (or young graduates hired as admissions counselors) to reach prospective students. However, now that everybody has more friends on facebook or twitter they can count on, it looks like the Wise and Knowledgeable are back in style when it’s time to make a decision. 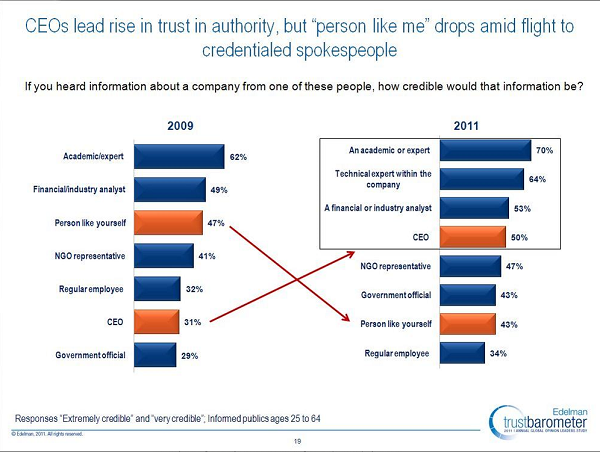 That’s what Edelman TrustBarometer 2011 presented earlier today in Davos (via Steve Rubel) found. This comprehensive study conducted in several countries every year for the past 10 years has found that a vast – and increasing (70% vs. 62% in 2009) – majority considers academics and experts as very or extremily credible. What’s important to know to understand this shift is that the same study found in 2006 that a “person like me” was the most trusted. Colleges have used faculty members to seal the deal by calling prospective students – later in the admissions process. However, I’m wondering if this shift in trust doesn’t call for earlier interventions from the most trusted people today – maybe via blogs, videos or even chats targeted to prospective students or their parents. Using faculty earlier or more extensively in the admissions process can be a challenge for a variety of reasons: time, politics, recruiting mindset, etc. That’s not saying it isn’t worth pursuing, but there are other ways to connect prospective students with credentialed spokespeople. If there is value in using credentialed spokespeople (and I agree that there is), a very effective approach can be using seasoned admissions professionals. In the corporate sales world, how often would a company hand over a (multi-)million dollar account to someone fresh out of college, pay them little while having them put in extensive hours, expect them to be gone in two years, then start with a fresh kid out of college to fill that spot? Sounds crazy, yet that is the norm in college admissions. Take the admissions person that has been in the office five years, ten years, maybe more. Perhaps they even started in another field and later came to college admissions. They speak with authority. They can pull out a story, stats, etc., related to nearly any major or interest, and have repeated and honed that story over time. Multiply that across your whole admissions staff. At that point you have an office full of credentialed spokespeople that are on message, have a recruiting mindset, etc. Really a great point, Robinteractive. Simple but it makes sense. While I know that involving faculty in the process might be tough, I think that using them more in online efforts shouldn’t be impossible — especially in the coming years where recruitment is going to become more and more challenging due to changing demographics trends. Ken, you’re right – the survey was done with college-educated folks aged 25 and older. However, the change in the trend is showing a deeper shift – and might have an impact with parents of prospective students who are taking a bigger and bigger place in the decision process. You hit the nail on the head with parents, Karine. In recent years they’ve taken a larger role much earlier in the admissions process: requesting info, calling in with questions, filling out applications for admission… At least that has been my experience. Interesting question, and I appreciate the data you’ve found to back it up, Karine. My experience is pretty much the opposite. When I moved to the UK from having worked in Canadian and American (international) universities, I was surprised to find I had to fight to “take away” admissions from academic staff, and had to work to build their confidence and faith in a professional admissions service. I still foresaw the importance of access to faculty as a real selling point for potential students, but I felt they (faculty) should focus more on developing enthusiasm for their subject than be considered campus experts – thus using them in a limited, but effective way, freeing them up to spend more time on their core activities. But I faced great resistance, as is often the case when trying to change organisational culture. In the UK, generally-speaking, faculty members “own” admissions. It leads to a necessarily decentralised and somewhat chaotic communications process, which is a step too far, methinks! Wow, really interesting difference, Danielle. A quick question though: do faculty members “own” admissions in the UK at the graduate level or at the undergraduate level? How are the new budget cuts in higher ed influencing this practice in the UK? Hi Karine – both graduate & undergraduate, actually, which really surprised me. Part of the reason I suppose is that unlike the North American system, UK undergraduate degrees are only 3 years – they are more specialised straight off the bat and lack the general education-style first year. But you are right to point out that funding considerations may force the issue. More and more universities are offering a centralised service because of the economies of scale and increased potential to provide students with the service they expect. But it’s still viewed as a necessary “evil” as opposed to being seen as a professionalisation of admissions and recruitment. Having worked in admissions I’d like to second robininteractive’s point about the difficulty of involving faculty in the admission process. They have a limited amount of time that they can give to admissions, with classes to teach and research to pursue. We find that there are a dedicated few who answer the call when our admission office needs faculty reps for panels, last minute interviews, presentations, etc. Time is limited, but their expertise and authority are important – as proven by your data. This is one reason why I’ve pushed for an increase in faculty blogs this year. Prospective students want to know what their faculty are going to be like, what courses the department teaches, and the opportunities they’ll have to research or internships. 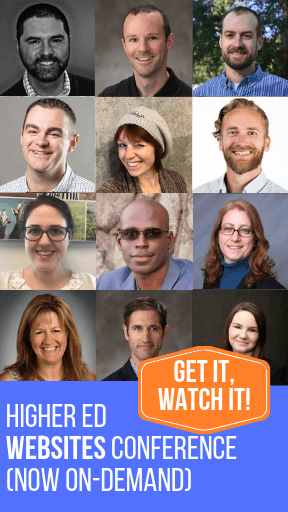 The blog lets faculty make updates and connect with students more conveniently and it shows faculty that they do play an important role in the admission process. That was exactly my point, Mallory. I think that faculty blogs might be a good addition to the mix. Care to share a link to your faculty blog? Would love to check it out. Of course I can Karine! We have 8 faculty blogs right now, some are authored by individual faculty members and others take a team approach. They can all be found on http://www.smcblogs.com. Is there policy from the institution for these faculty blogs? Or some sort of over-seer? Are the faculty setting them up themselves? Or is there assistance with the process? My position at the college is to manage social media efforts campus wide. Faculty who are interested in setting up a blog will contact me. The interested faculty and I will meet for about 45 minutes, during this time we set up the blog and it’s design and if they aren’t familiar with Blogger I will train them how to use it. We talk about “best practices” and different ideas for content. Each blog has the official college account as an administer, as well as the faculty member(s). Once a month I send our faculty and staff bloggers an email with a Google Analytics update. (Which reminds me… I need to do that today!) I find that not only serves as a gentle reminder to post new content but it shows the faculty that the time they’re putting into the blog is appreciated and worth it! We’ve been happy with the amount of traffic their blogs have been receiving.